I can’t remember when I started making this dish but it’s one of those midweek family meals that’s developed and changed over time. The best time of year to eat it is the Summer or early Autumn when courgettes, peppers and celery are all in season – that way you get 8 different vegetables into the dish. From what I’ve seen, kids really seem to like puy lentils – maybe because they aren’t soggy and they retain their firm structure – as long as they aren’t over-cooked. 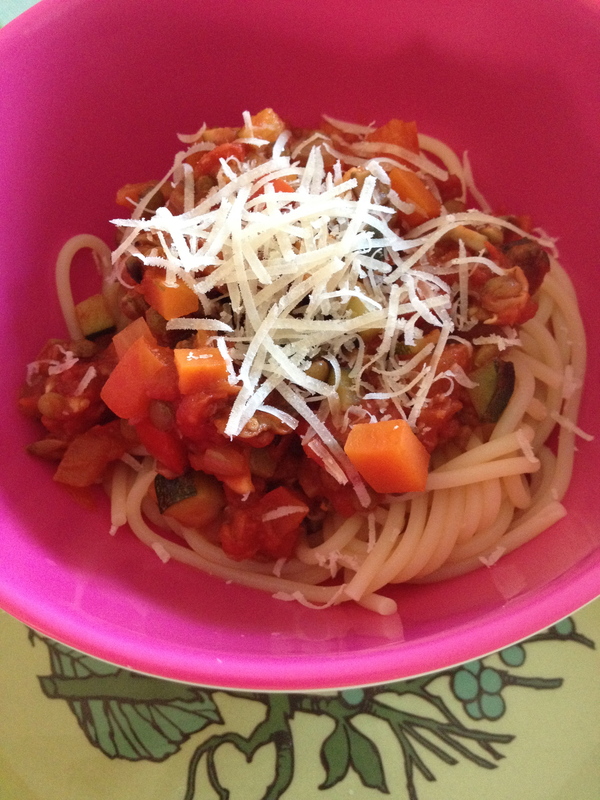 So it makes a good alternative to meat spaghetti bolognese. 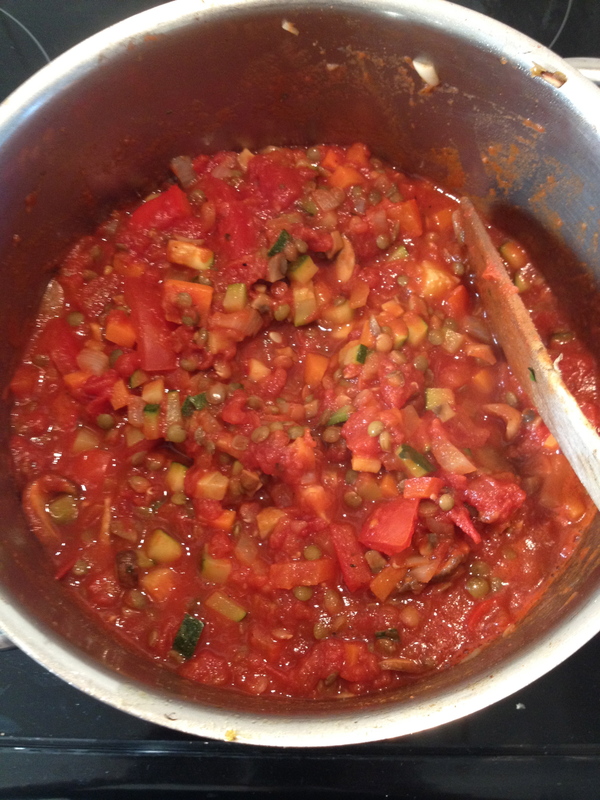 I’m not keen on pasta, so I usually a bowl of the puy lentil bolognese just by itself. If you have any raw tomatoes that have gone a bit too soft to eat in a salad, then you can chop them and add them along with the chopped tomatoes. You will need… 2 tablespoons olive oil 1 teaspoon Smoked paprika (optional) 1 teaspoon mixed herbs 1-2 garlic cloves 1 medium onion 1 medium carrot A celery stick 150g mushrooms 1 courgette 1 pepper 400g Carton of chopped tomatoes* tablespoon tomato puree 100g puy lentils Handful of fresh basil How to… Wash and top and tail (where need be) the veg and dice. Bring a pan of water to the boil. Rinse the puy lentils and add to the boiling water. Cook for about 20 minutes until soft enough to eat but not too soft. Drain and put to one side. Heat the olive oil in a heavy bottomed pan. Add the onion, carrot, celery and garlic and sweat until softened and translucent. Add the courgette, pepper and mushrooms stir and cook for a few minutes. Add the smoked paprika and mixed herbs and cook for a few more minutes. Then put the puy lentils in and stir. Pour in the chopped tomatoes (and raw ones if you’re using them) and stir well. Add the tomato puree. Cook for about 10 minutes, until the sauce is reducing nicely (this intensify’s the flavour). You don’t want to cook it for too long though otherwise the vegetables begin to loose their colour. Add chopped basil a minute or two before you take it off the heat. Serve with pasta and parmesan. Allergens You can obviously make this dish dairy free by not including the parmesan and/or egg free or gluten free by using gluten free/egg free pasta. *When I made this dish today, I used an extra 200g of chopped tomatoes that I had left over from another dish. If it looks like you need more tomatoes or liquid, just add a bit more or if you don’t have any more, just rinse out your chopped tomato carton with a little water and pour it into the pan. Or you could use 1 or two raw tomatoes. I used to make this all the time. Thanks for reminding me. I used to make double the amount and turn leftovers into a curry.